In the third of a series of articles about the finest Scottish winter routes, Jöttnar's Mike Pescod guides us through Gemini on the Carn Dearg Buttress, Ben Nevis. When the snow has built up and the January storms have created the best ice and mixed conditions, Gemini can be one of the best climbs on Ben Nevis. It is grade VI and combines steep cascade style ice at the start with icy mixed climbing at the end. It sits on the right side of Carn Dearg Buttress on Ben Nevis and at quite a modest altitude, conditions do need to be excellent for this climb to be formed. There is no warm up on Gemini! The first pitch is a long icy groove with some very steep climbing on hard ice. A more reasonable second pitch lands you at the foot of the obvious and very impressive smear of cascade ice halfway up the climb. If this is fully formed it can be taken from its foot, giving another long, steep and this time very exposed pitch. If it is thin at the base, a traverse in from the right side is quite feasible but certainly no easier. 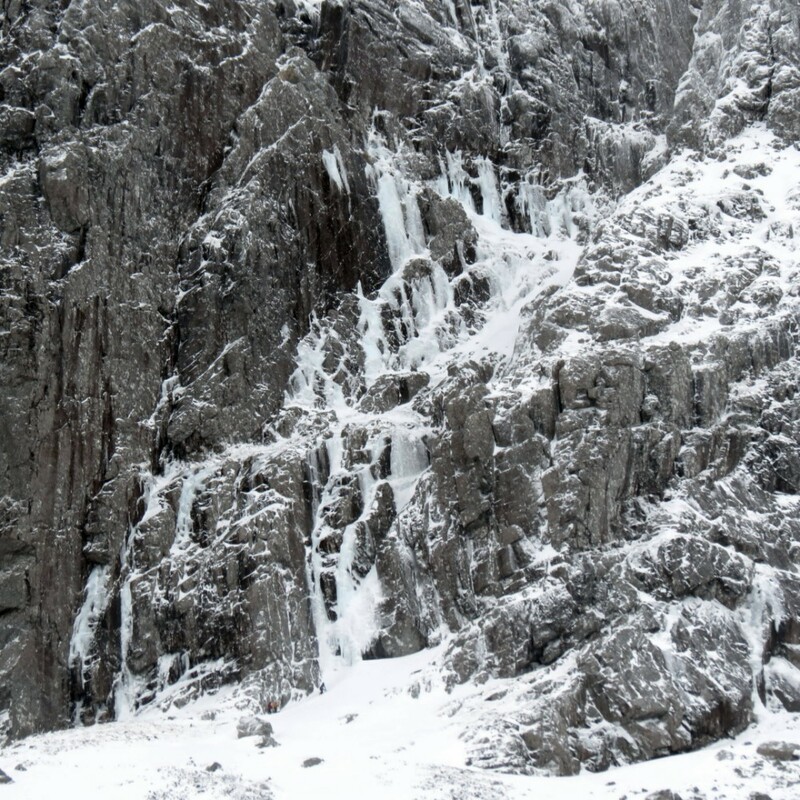 Mixed pitches of rock, turf and ice then lead up to the twin grooves that give the climb its name. Decide which of these looks best and go for it. This is the last of the hard climbing but getting up to the traverse shelf on Carn Dearg Buttress that takes you to Ledge Route is still quite exciting. Climb the first two pitches of Waterfall Gully. Above on the left wall a series of rightward-sloping ice ramps and steep ice-smears sometimes forms. These are followed to an enormous detached flake. 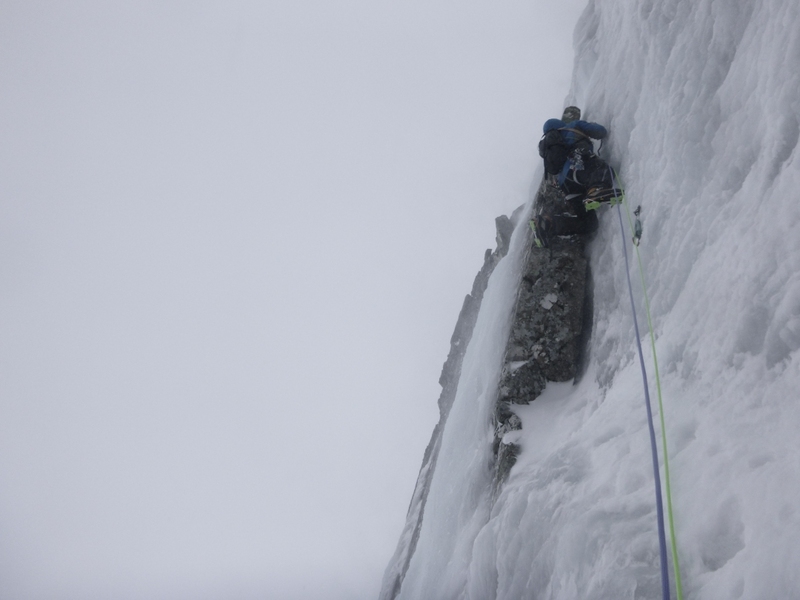 Climb very steep ice on the wall left of the flake to a ledge and rightward-sloping grooves. Move up and right to obvious twin grooves, either of which can be climbed to a broad ledge, which is followed right. Climb up via iced slabs to easier ground. A very steep direct start to the left of the first pitch of Waterfall Gully can be climbed, thus avoiding that route entirely. Combined with this start Gemini becomes one of the finest routes on Ben Nevis (A. McIntyre and A. Kimber, V,6***, 1st April 1979). Note: The direct start had been climbed previously by at least two parties as a more difficult start to Waterfall Gully. One of them reported it to be in grade IV condition at the time! 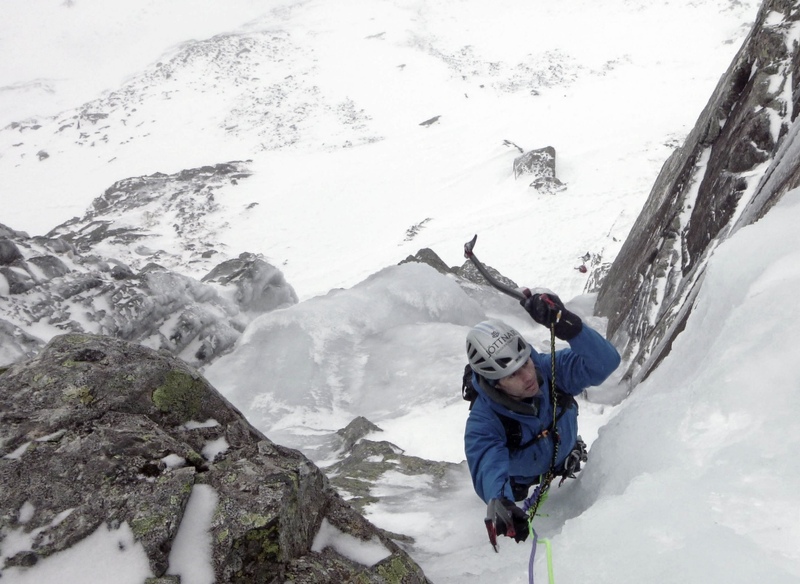 Mike Pescod is an IFMGA guide, and a member of Jöttnar's Pro Team. He is the founder of Abacus Mountain Guides, an outdoor guiding company based in Fort William, as well as being the author of the guidebook Winter Climbs Ben Nevis and Glen Coe. Gear worn: Bergelmir hardshell jacket & Vanir salopettes.